Hats Off to this Trunk Show! Every now and then people submit inquiries into Cincy Chic about things they want/need but can’t find, and ask for our opinions or suggestions. I received one a couple weeks ago from a woman, and she asked where she could get a nice derby hat around Cincinnati. I talked with someone else today at an event and this same question came up. So, I decided to start a new category of this blog called “Ask Amy.” Whenever I get a good question I think you’ll benefit from, I’ll publish the question and my answer. Click here to submit a question. I was curious if you know of any hat shops around Cincinnati that has women’s hats for a horse race such as Keenland? Just let me know! Thanks for writing. I actually wondered the same thing last derby season, and found one really good shop in the entire Tri-State: Ms Martha’s Dress Shop in Ft. Mitchell KY. But I recently learned that they closed up shop. Today I did some digging for you and asked some local boutique owners if they had any. I found two in Hyde Park for you: Sassy Boutique and Snap Boutique in Hyde Park. They aren’t super big or fancy. You may need to embellish them. If you want super big or fancy, you may be able to find some online. But if you’re not looking for that, and just want a cute hat to wear and to be able to try on here locally, those two shops are for you! 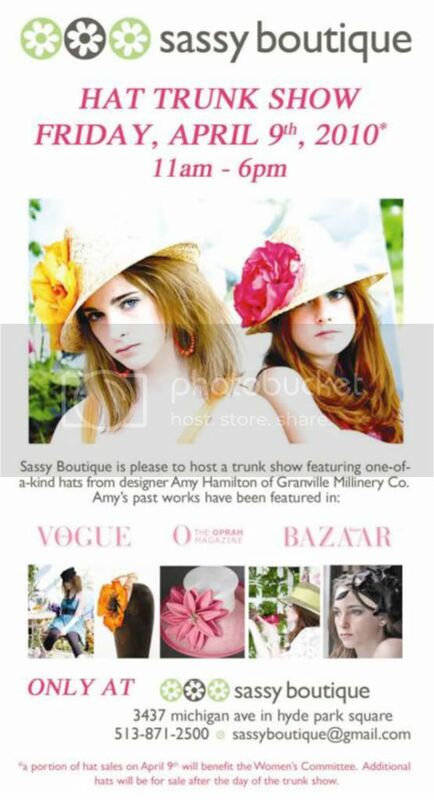 And just today I received an email from Amy at Soho (one of the boutique owners I asked when digging around) and she said Sassy Boutique is having a trunk show this Friday. Info below! Happy hat shopping! Amy, believe it or not I saw a ton of big cute hats at the TJ Maxx in Hyde Park. I also saw cute dresses there – but you have to dig through the racks to find them! Some were high priced hats, but the vast majority were reasonable!